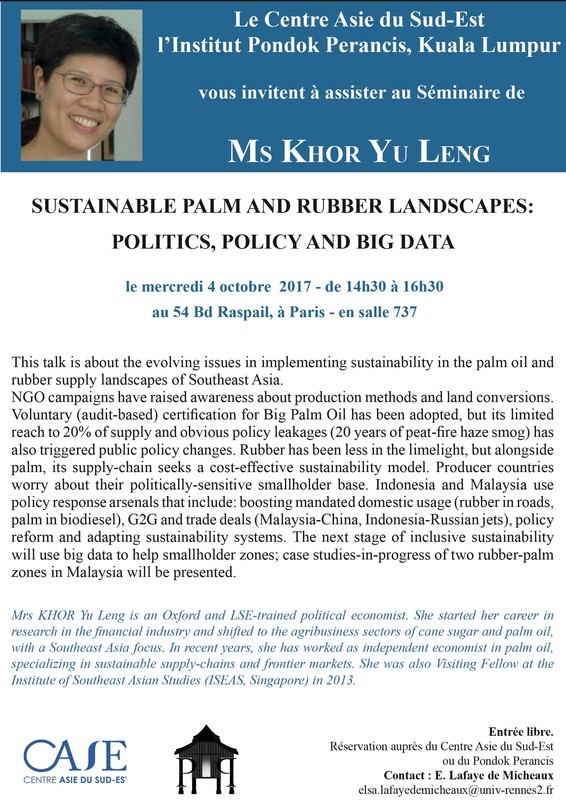 Séminaire Ms Khor Yu Leng "Sustainable palm and rubber landscapes: politics, policy and big data"
"Sustainable palm and rubber landscapes: politics, policy and big data"
This talk is about the evolving issues in implementing sustainability in the palm oil and rubber supply landscapes of Southeast Asia. NGO campaigns have raised awareness about production methods and land conversions. Voluntary (audit-based) certification for Big Palm Oil has been adopted, but its limited reach to 20% of supply and obvious policy leakages (20 years of peat-fire haze smog) has also triggered public policy changes. Rubber has been less in the limelight, but alongside palm, its supply-chain seeks a cost-effective sustainability model. Producer countries worry about their politically-sensitive smallholder base. Indonesia and Malaysia use policy response arsenals that include: boosting mandated domestic usage (rubber in roads, palm in biodiesel), G2G and trade deals (Malaysia-China, Indonesia-Russian jets), policy reform and adapting sustainability systems. The next stage of inclusive sustainability will use big data to help smallholder zones; case studies-in-progress of two rubber-palm zones in Malaysia will be presented. Mrs KHOR Yu Leng is an Oxford and LSE-trained political economist. She started her career in research in the financial industry and shifted to the agribusiness sectors of cane sugar and palm oil, with a Southeast Asia focus. In recent years, she has worked as independent economist in palm oil, specializing in sustainable supply-chains and frontier markets. She was also Visiting Fellow at the Institute of Southeast Asian Studies (ISEAS, Singapore) in 2013.